Make a bird bath with a mist shower for hummingbirds! 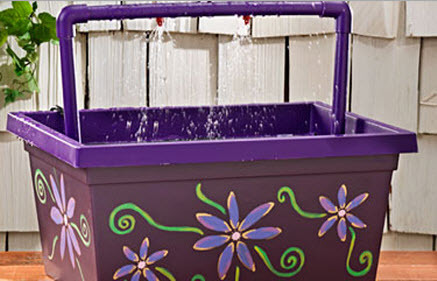 Find a large plastic container and cut three pieces of PVC pipe to fit inside the bucket. Cut three holes in the top shower bar for the mist spouts with two spouts facing down and one in the center facing upwards, and assemble the PVC shower frame with PVC connectors. Use steel wool to sand the PVC and plastic container, coat the pieces with primer, paint and decorate the bird bath and coat the pieces with a matte sealant. Use aquarium silicone or cement to glue misters into each of the holes in the pipe, attach the PVC pipes to a submersible pump and use rocks to stabilize the pump in the bird bath. Split the air hose to attach a bubble tube to the pump for a bubbling bath and use the toy as a water park for your pet frogs, reptiles or rodents!